Posted on September 30, 2013, 1:00 pm, by Andy, under Books, Horror. Every year when Halloween looms on the horizon, I find myself in the mood for scary stuff. In past Octobers, I’ve made a point of watching horror movies, playing horror-themed boardgames, or reading spooky books. This year, I find myself in a nostalgic mood, so I’m going to spend some of my October reading and reflecting on short stories by Stephen King. I spent a lot of time in college reading King, and although I loved many of his novels, I have always felt that his short stories represent his most interesting and entertaining work. I would go so far as to say that King’s short stories are some of the most memorable tales I read in all of my youth. I’ll be putting those fond memories to the test as I make my way through some of his stories, chosen semi-randomly and in no particular order (but with a bias toward his 1990s-and-earlier stories). I’m no Stephen King expert, and I claim no special insight or exhaustive knowledge of his writings. I’m just a guy reading some stories and talking about them. I’ll try to give you some advance notice of the story I’m reading next just in case you want to read it with me. 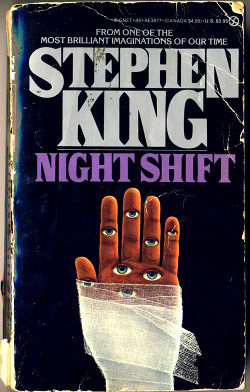 If there are tattered copies of Night Shift, Skeleton Crew, Nightmares and Dreamscapes, or other King short story collections gathering dust on your bookshelf, dig ’em out and let’s pay them a visit! First up (tomorrow) is “You Know They Got a Hell of a Band,” from the 1993 short story collection Nightmares and Dreamscapes. Read it with me! Great first choice! Once you’re done with this project, you should check out some stuff from Everything’s Eventual and Just After Sunset. I also highly recommend the novella collection Full Dark, No Stars. Thanks, Jonathan! I actually just read “Full Dark” and I own, but have not read, “Just After Sunset.” While I’m most interested in King’s older stories, I will try to include a couple newer ones as well. If you have specific suggestions, let me know! OK – got home from book club and I just got done reading YKTGAHOAB. Great as ever. Looking forward to your write-up!